The North American mobile satellite system (MSAT) began providing the United States and Canada with an unprecedented range of innovative mobile satellite services in 1995. MSAT is the first dedicated system in North America for mobile telephone, radio, facsimile, paging, position location, and data communications for users on land, at sea, and in the air. Canada-based TMI Communications & Company Ltd. of Ottawa, Ont., and American Mobile Satellite Corporation (AMSC) in Reston, Va., signed contracts with Hughes and Spar Aerospace Ltd. of Canada in 1990 to build their respective satellites for the initial systems. TMI and AMSC each own and operate identical spacecraft. Both will provide complementary mobile services, and each will provide backup and restoration capacity for the other. MSAT-1 operates at 106.5 degrees West longitude. AMSC-1 is at 101 degrees West. Hughes was the prime contractor for AMSC's satellite, called AMSC-1, and Spar was the prime for TMI's spacecraft, called MSAT-1. Hughes Space and Communications Company in El Segundo, Calif., managed the program and provided the Hughes HS-601 satellite buses. Spar's Space Systems Group is providing the high-power payloads and conducting spacecraft integration and testing at the Canadian Space Agency's David Florida Laboratory in Ottawa. The payload is the result of a 10-year mobile payload technical development program supported by the Canadian federal government and Spar investment. Each satellite has the capacity to support up to 2000 simultaneous radio channels, depending on the type of antenna used and bandwidth allocated. Communications between the mobile users and the satellites are accomplished in L-band; terrestrial feeder stations use Ku-band to communicate with the satellite and with one another. L-band effective isotropic radiated power (EIRP) is 57.3 dBW. A 30-inch (.75-meter) shaped reflector antenna connects the Earth stations in Ku-band. Its EIRP is 36 dBW. Such high signal amplification by the satellite permits the use of small, low-power mobile and portable antennas. The Ku-band is driven by one powerful traveling-wave tube amplifier (with two spares). Each satellite uses four spot beams at L-band to cover North America and 300 kilometers of coastal waters. Another beam serves Alaska and Hawaii. The Caribbean beam includes Puerto Rico, the U.S. Virgin Islands, and Mexico. Each beam transponder is equipped with eight surface acoustic wave filters covering the 29 MHz L-band allocation, allowing selection of filters to match traffic needs and to coordinate with other international users. The spacecraft were designed with the capability for frequency reuse between the North American east and west beams. The beams are combined into two L-band power pools, one covering the east and central beams, and the other covering the remaining service areas. Each power pool is generated by a hybrid matrix amplifier assembly. The satellites have 16 active and four backup Spar-designed solid-state power amplifiers for L-band, each operating in a linear mode nominally at 38 Watts. TMI's MSAT-1 was carried by an Ariane-42P H10-3 booster from Kourou, French Guiana, on 20 April 1996. The AMSC-1 satellite was launched on an Atlas-2A rocket from Cape Canaveral, Fla., on 7 April 1995. Like others in the HS-6011 series, the MSAT satellites consist of a cube-shaped center payload section, with the solar panel wings extending from the north and south sides, and an antenna array. The HS-601 is composed of two modules: the primary structure, which carries all launch vehicle loads and contains the propulsion system, bus electronics, and battery packs; and a payload module, which holds communications equipment and isothermal heat pipes. Reflectors, antenna feeds, and solar arrays mount directly to the primary module, and antenna configurations can be placed on three faces of the bus. Such a modular approach allows work to proceed in parallel on both structures, thereby shortening the manufacturing schedule and test time. Each MSAT satellite measures approximately 62 feet (18.9 meters) across with its two antennas deployed, and 68 feet, 9 inches (21 meters) long from the tip of one three-panel solar wing to the tip of the other. These arrays generate more than 3 kilowatts, backed up by a 28-cell nickel-hydrogen battery for power during eclipse. The MSAT spacecraft are the first to use Hughes' innovative Springback antennas. Weighing 45 pounds (20 kilograms) each, they are made of graphite in a 22.3-foot-by-17-foot (6.8-meter-by-5.25-meter) elliptical shape. The unique design not only provides a lightweight antenna, it also takes advantage of normally unused space in the top of the rocket fairing. Instead of being folded against the spacecraft body for launch as conventional antennas are, two Springback antennas are rolled together into a 16-foot (4.9-meter)-high cone shape atop the satellite. The cone is about 5 feet (1.5 meters) in diameter at the top and about 10 feet (3 meters) in diameter at the bottom. For launch, the solar arrays fold accordion-style against the sides of the spacecraft. A flight-proven bipropellant propulsion system with an integral 110-lbf liquid apogee motor and 12 5-lbf thrusters afford a minimum 10-year service life. At the beginning of life in orbit, the spacecraft will weigh approximately 3783 pounds (1716 kilograms). 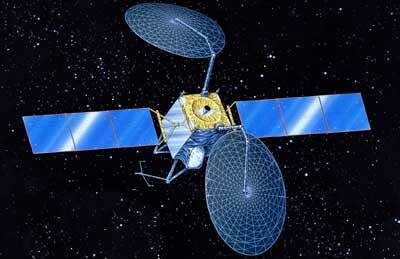 M-Sat 1 has lost two power amplifiers. Mobile Satellite Ventures (MSV) has moved all customers to AMSC-1 but hopes to use the remaining capacity on MSAT-1 for coverage of eastern North America.